People discovered the healing properties of crystals in ancient times and do their best to collect all information about them. They discovered that healing crystals can help a person to cure their body, revitalize and detox. For stomach healing purposes it was discovered that by placing healing stones on the solar plexus, you can heal stomach aches, fatigue, relieve abdominal pain, constipation, etc. 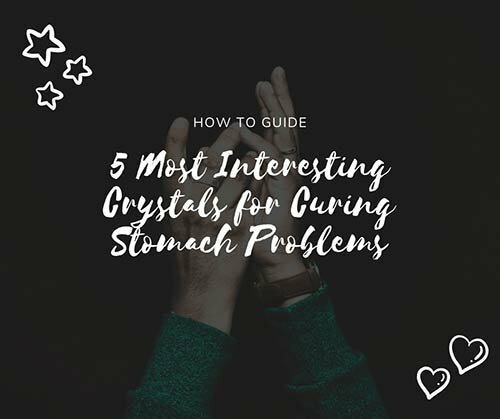 Healing crystals are used for many more purposes related to stomach problems like colon issues, menstrual cramps, bowel movement problems, and many more others. In the next few lines, we will discover 5 most interesting crystals. Agate is considered a balancing stone. A person who wears this gemstone is protected from cold infections, it helps reducing toxins in the body and reduces hunger. It is especially good for those people that have food binge eating problems. Agate is for sure best gemstone used for whole body detoxification. Blue gems are used for opening blocked pressure valves and helps clearing intestine gas related problems. Malachite is considered as a gemstone that is the mirror of the soul since ancient times. It was used in the past for releasing guilt and gut problems. Best way to utilize healing energies of a malachite gemstone is by wearing it around the waist. People believe that this will ward off indigestion problems, gastric troubles, and acidity. A prominent effect of using this gemstone is curing stomach infections. Problems with vomiting and nausea are pretty common today just like in the past. Peridot is considered as a healing gemstone that is used for warding off sickness, nausea and vomiting problems for a long time. In the past it was used as a medicine for the flu while rubbing the tip of the crystal should heal stomach issues. Healers used peridot as well for curing more complicated stomach disorders like bloating and ulcer. For a long time, Jasper is used in healing due to its great power and properties. Red Jasper is especially great for basal chakra. It is great for balancing the physical body and for getting rid of all unwanted food that is the main cause of giving heartburn to the person. Great relieve can be achieved when red jasper is used as effective relief. Emerald is very interesting healing crystal that is used since ancient times by healers. The main purpose of this magical gemstone is for energizing heart chakra and covering up the pain connected with the nerves. It is also used for easing pain connected with the stomach and soothing affected area. Some crystal experts state that it is beneficial to wear emerald gemstone during preparing and cooking meals to making the food more healthy. Much more interesting information about healing properties of different gemstones can be found on the source website page: 26 Crystals for Stomach Pain, Nausea & IBS Heal Your Digestive System!! You will find many more uses of crystals for soothing and healing problems related to stomach pain and its relief.